These wonderful, make-ahead, Belgian waffles are light and simply delightful with our Maine pure maple syrup, or our blueberry compote! Heat milk, water and butter until very warm (120-130 degrees F; butter does not need to melt). Add to flour mixture. Add eggs. Blend with electric mixer at low speed until moistened; beat 1 minute at medium speed. Cover bowl with plactic wrap and foil; refrigerate several hours or overnight. Pour approximately 1/2 cup batter on preheated grid, close and bake. 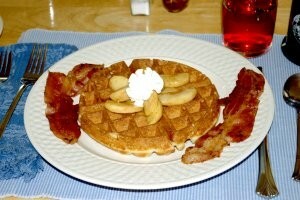 We serve them with pure maple syrup, blueberry compote, or maple apple syrup (pictured).